How do you like the 2019 Ram 1500‘s refreshing new look? If you look closer, you will realize it is remarkable for a pickup. 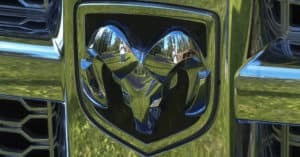 Given the fact that Ram truck is important to Fiat Chrysler’s lineup, the new model has a lot of changes, including improved aerodynamics, new 98% high-strength steel frame, and hybrid technology that replaces the alternator with a Motor Generator Unit. The new Ram gets an insane 12-inch touchscreen. It is the biggest infotainment touchscreen of about 8.4-inch. The glove box, cup holders, and dashboard have also been redesigned. With some of these features coming to life, let’s take a closer look at the coolest tech of the 2019 Ram 1500. “eTorque,” as FCA referred to the Motor Generator Unit (MGU), powers electronics that are all boxed together in the accessory drive. It is also unique because it uses air to cool the motor with its 5.7-liter V8. The biggest benefit of an air-cooled MGU is that the Motor Generator Unit makes the system less complex. Another benefit of the new MGU is that the cooling system does not have to handle loads of heat, and the water pump does not have to handle an additional pressure drop. FCA used computational fluid dynamics modeling to see that the exhaust and the fan discharge temperature cause no overheating issues. This small pack of 40-volt battery sends and receives current to and from the MGU. The battery is packed at the back of the rear seats. While drawing in the air through the cabin, the battery also sends out the air via rubber exhausters behind the cab. Start-stop performance appears to be the biggest benefit of this new mild hybrid system. The MGU has the power to produce up to 130 lb-ft of torque. Even though you are not required to add it to engine torque before you get the total, the torque is only provided for the engine to fire back after the driver takes the foot off the brake. The start-stop performance also produces seamless and smooth impact. The new frame is 100 pounds lighter because it’s constructed with high-strength steel. The frame has a wild look from the front. Its big octagonal rails begin next to the hookups of the front suspension and reach towards the outside of the truck attached to the front bumper beam. This new design will allow the frame absorb different crash conditions. The transmission has a bit of aluminum as well as at the lower control arm. The upper has a stamped steel control with nylon reinforcement on the underside. When it split off from Dodge in 2009, designers of Ram blended rugged and modern design features. Since the new Motor Generator Unit is designed to boost electric power, it will be interesting to see how much magic has been added to the new Ram driving experience.